Choline bitartrate is the salt form of choline, an important essential nutrient. This wonderful compound has a number of great effects on both your brain and your body. Choline bitartrate supplements produce a number of Nootropic effects including improved memory, cognitive boosts, and mental stimulation. Not only this, but choline bitartrate is great at protecting your body and health. It is a powerful anti-inflammatory, offers great protection for your heart, and is great for post-menopausal women. 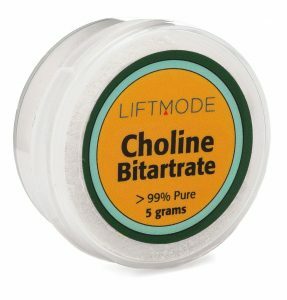 So, with Choline Bitartrate, you get amazing Nootropics effects along with reducing your risk of health issues. Sound good? Read on! Why is choline good for your brain? Choline has remarkable effects on your memory and your brain. A number of scientists have examined the importance of choline for the proper development of the brain. One study found that choline is an essential part of the development of the hippocampus in animals. Although no human studies have been done, the study showed that choline was important for brain development. Another study, again with animals, confirmed these findings and concluded that choline is a requirement for the proper development of memory in children and infants. It suggested that pregnant women need to pay extra attention to dietary choline. Another great benefit of choline is that it improves your cognitive performance. One large human study, with 1391 participants, found that higher dietary choline intake was associated with lower rates of white-matter hyperintensity and better cognitive performance. Choline is the direct precursor for acetylcholine, the ‘learning transmitter’. Your brain transforms choline into acetylcholine to allow it to function properly. Acetylcholine is involved in transmitting signals across neurons. You really can’t overstate how important acetylcholine is to your brain. Studies have found that acetylcholine is a vital molecule for learning and memory. This is why it’s called the ‘learning transmitter’. Acetylcholine also has stimulant effects in your brain. It gives you more mental energy and makes your mind more alert. Many stimulants interfere with acetylcholine function, often causing your brain to produce more acetylcholine. Choline is great for your body too! How is choline good for your body? Scientists have conducted a number of studies that looked into the importance of choline in your diet. The amount of choline that each person requires depends on a number of genetic factors. A number of studies have shown that choline is effective at reducing inflammation. Chronic inflammation, as a result of stress, an animal-protein-rich diet, smoking, and alcohol use, greatly increases your risk of developing serious diseases. Homocysteine is a dangerous by-product of human metabolism and is known to increase your risk of heart disease. High homocysteine levels often occur as a result of a lack of vitamin B12 (from microorganisms), B6, or folate (from vegetables). Scientists have shown that choline significantly reduces your homocysteine levels. You get most of your choline from your diet, but a large amount of it is also produced inside your body. The estrogen hormone is vital for the production of choline. After menopause, your estrogen levels are left depleted. This results in lower choline production. Low choline levels, as we’ve seen above, are related to a number of diseases, so supplementing with choline is a good idea! What is choline found in? You'll find choline in nearly all plants and animals. It is an ancient molecule and is part of the biochemistry of all living things. For most people, even vegans and vegetarians, a balanced diet contains more than enough dietary choline to keep you healthy. However, it’s not possible to get the Nootropic effects of choline through your diet. Even in the foods that are richest in choline, the concentration is too low to realistically provide Nootropic effects. This is why we suggest using a choline supplement. What forms of choline are there? Choline bitartrate is the salt form of choline. 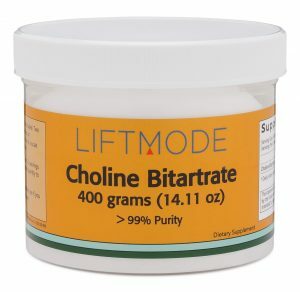 Bitartrate is an added chemical group to prevent the choline from going ‘off’. In this form, choline is stable and readily available to be metabolized by your body. What is choline salicylate? and what is choline chloride?. These are simply two different forms of choline. However, choline bitartrate is the easiest to manufacture and the most stable form. In conclusion, choline is a very important molecule that helps your brain and your body to function properly. What is choline good for in the brain? It improves your memory, boosts your cognition, and stimulates the mind. What is choline good for in the body? It is a potent anti-inflammatory, protects from heart disease, and is vital for a number of key functions. Choline deficiency is causes a number of diseases. However, most people get enough choline in their diets to remain healthy. However, choline supplements are the only way to access the incredible Nootropic effects!